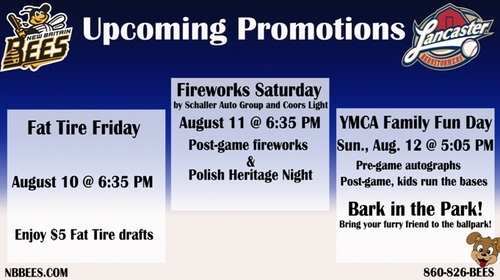 Close out the week with a spectacular firework extravaganza, presented by Schaller Auto Group and Coors Light. Take the family to Family Fun Day with the Bees. Before the game, fans are invited on to the field for an autograph session with the team. After the game, kids can take the field and run the bases. Don’t forget to purchase a YMCA Family 4 Pack for just $44 when you get to the stadium. This great deal includes 4 field box tickets, 4 hot dogs, 4 bags of chips and 4 sodas or waters.